A small nakamal on Pentecost Island. A nakamal (a Bislama word from vernacular terms such as Raga gamali) is a traditional meeting place in Vanuatu. It is used for gatherings, ceremonies and the drinking of kava. A nakamal is found in every significant Vanuatu community, but the design of the nakamal and the traditions surrounding it vary between areas. 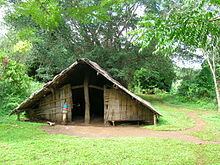 In north and central Vanuatu, the nakamal generally takes the form of a large building, assembled from traditional materials with the help of the entire community, under the direction of a particular chief. Entry to the nakamal is often restricted to men, and the building may be used as a sleeping and living area for unmarried men and boys and for male visitors to the village. Significantly, most nakamals lack a lockable door, indicating that all friendly visitors are welcome, although there may be a low barrier across the entrance to keep out animals. In front of a nakamal there is often a flattened clearing, or nasara, used for dances and outdoor gatherings. In southern Vanuatu, a nakamal may be a large, sheltered outdoor space, such as under a banyan tree. In Vanuatu's capital Port Vila, the assembly building of the national council of chiefs (Malvatumauri) is designed in the form of a traditional nakamal. The nakamal's most prominent function nowadays is as a place for the preparation and drinking of kava. In urban Vanuatu, and in neighbouring New Caledonia, the term nakamal may be used for a kava bar where the drink is sold, although in rural Vanuatu a traditional nakamal (where kava preparation is a communal activity and money does not usually change hands) is distinct from a kava bar. An urban 'nakamal' or kava bar at which kava is available for sale is advertised by a coloured light displayed at the entrance.